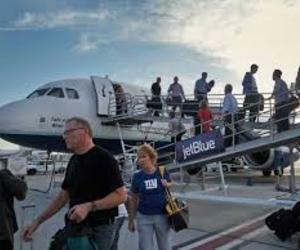 JetBlue Airlines CEO Robin Hayes stressed the efficiency of Cuban airport services after the arrival on Wednesday at Santa Clara's Abel Santamaria International Airport of Airbus A-320, which resumed direct and commercial US flights to Cuba after over 50 years. Hayes stressed the significance that US Secretary of Transportation Anthony Foxx was among the passengers who witnessed the reopening of the flights between the two nations, and he said he hopes that in just couple of months regular flights reach up to four Cuban cities. Meanwhile the head of the Legal Department at Cuba´s Civil Aeronautical Institute, Mercedes Vazquez said that the event is a contribution to the process towards the normalization of bilateral relations between Cuba and the United States, but current advancement in that direction are still hindered by the over-50-year US economic, commercial and financial blockade of Cuba. Vazquez explained that some 110 foreign airlines fly to Cuba at present, as Cuba registered 18 percent increase in the number of visitors in 2015 with respect to the previous year. Robin Hayes and Airport director Omar Gil cut the ribbon that symbolically inaugurated bilateral air operations between the two countries in a ceremony attended by Cuban deputy Transportation minister Eduardo Rodriguez and by the president of the Provincial government in the central province, Jorgelina Pestana.